Obligatory clickbait-y intro: in case you’ve been living underneath a rock, there’s a new Iron Maiden album out. It’s called The Book of Souls, sports 92 minutes of new music and it’s the first they’ve put out in five long years. I know if it’s good or not, and I’m telling you after the cut. That intro sort of sums it up for me: what can you still write about British heavy metal heavyweights Iron Maiden which has not been written a million times before? You all know these guys have been around for about forty years. You know The Book of Souls is the sixteenth album by a band who’s leader famously once said they’d only release fifteen. You know that it’s the first double studio album they’ve put out, and that it contains the longest song they have ever recorded in Empire of the Clouds. You already know all that, bereaving me of the chance to tell you all that. At the end of the day though, the only question is whether or not The Book of Souls is a good album. And I can give you the answer. Of course it is. But you probably knew that as well. The coming weeks, months and years will still see the same discussion all over internet fora, message boards and the like, if The Book of Souls is a better or worse album than [insert your favourite Iron Maiden album here]. Of course it will, and it’s one of those questions no-one will resolve easily. Not that it matters. The only thing that really matters here is that we’re treated to 92 minutes of brand new Maiden material, and that we should be grateful that these metal dinosaurs are still at it, especially after vocalist Bruce Dickinson’s scary – but momentary – bout with cancer last year. It’s one of the last big acts from an almost bygone age, and we are lucky to still have them amongst us. Iron Maiden is a bit like Motörhead or AC/DC, in that you know exactly what you can expect from them, and The Book of Souls is, by and large, a typical Maiden album with a twist or two thrown in for good measure. The album opens with an eastern-sounding intro to lead us into If Eternity Should Fail, one of two songs penned solely by Dickinson. 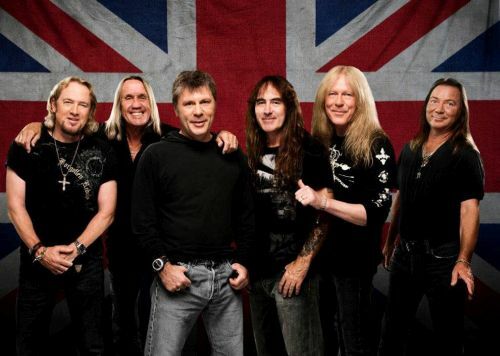 It’s a song which immediately shows where Iron Maiden stands in 2015: the quiet, moody intros are back again, there are more tempo changes than your average cross-country train ride, and Iron Maiden still sounds very much like Iron Maiden. As if anyone had expected otherwise. The album then dives into Speed of Light, which, at first, seems like it’s weakest song on the album (which would not be a surprise, seeing that Maiden singles more often than not are the least interesting songs). After a few spins, however, it turns into a very straightforward rocker you won’t be able to get out of your head again. Especially Adrian Smith’s guitar lead, around which the entire song is based, turns out to be exceptionally catchy. And it could be me, but I’m very much getting a Deep Purple vibe from this one, from Dickinson’s opening screams to the main riff (Burn anyone?). The Great Unknown feels like it could have been a left-over from the Brave New World sessions, and sounds like a shorter, more compact version of The Thin Line Between Love and Hate. A very decent song with a few good hooks and riffs, but ultimately a bit too safe. The Red and the Black, the only solely Harris-penned song this time around, starts out like a slower version of The Trooper, and definitely panders to a live audience with the very predictable ‘woo-hoo-hoo’ choirs thrown in at appropriate moments. Just when you’re about to check your watch to see if this Fear of the Dark lite is over yet, it turns into something completely different, as the song speeds up gradually and ends on a seven minute instrumental note, with some great solos tucked in there. It reminds a bit of Hallowed Be Thy Name’s ending, and it completely saves what would otherwise be a thirteen minute slog. A real surprise there. When the River Runs Deep is a solid if fairly standard Maiden rocker with a rather unimpressive chorus, and one of the speediest songs on the entire album. The title track more than makes up, however. Slow and brooding, it runs for ten minutes and does epic on a Powerslave scale, with, again, eastern melodies driving the song and an up-tempo middle section. Death or Glory is another speedy highlight, where Bruce surprises friend and foe by turning in one of his best vocal performances in ages. Shadows of the Valley, after that, recycles the main riff of Wasted Years. It’s a bit of a lacklustre song at first, but it’s saved by some stellar guitar playing a bit further in. Tears of a Clown is another sleeper hit on this album. Dedicated to the late, great Robin Williams, it’s a song about depression and keeping up appearances, and it’s as wry as it’s effective. The song’s very catchy and turns into one of the highlights of the album. After that, The Man of Sorrows falls a bit flat. Not a bad power ballad per se, it’s rather unremarkable, and bookended by to much better songs. And speaking of much better songs: Dickinson-penned Empire of the Clouds, running at eighteen minutes, turns into the definite, epic highlight of The Book of Souls. Starting out with Bruce on piano, soon the band joins in to deliver what surely is the most diverse and ambitious song Iron Maiden has ever released. It’s eighteen minutes of goose bump inducing music. Maybe not the definitive masterpiece the media tends to see in it, but a stellar achievement nonetheless. 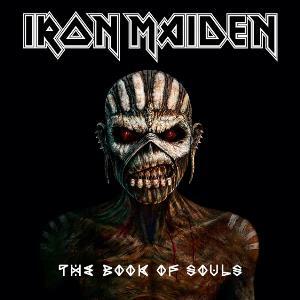 In the end, The Book of Souls is another Iron Maiden album, nothing more and nothing less. The band never treads new ground and keeps things safely in their comfort zone, with only Empire of the Clouds colouring outside the lines a bit. That does not mean it’s a bad album, although it suffers a tad for being too long. Had the band left Shadows of the Valley and The Man of Sorrows, for example, on the cutting room floor, The Book of Souls would have been a stronger, more compact album. In its current form, it’s more bloated and it probably could have been, and that’s a shame. But it is also the only real complaint I can lob at Maiden’s sixteenth effort. There’s enough to enjoy for old and new fans alike, and I do think it’s a small but noticeable improvement over 2010’s The Final Frontier. Bottom line: there’s a new Iron Maiden album out. It’s called The Book of Souls. Not that you care. You’ve probably already bought it. This entry was posted in RP and tagged 2015, Adrian Smith, Bruce Dickinson, Dave Murray, Empire of the Clouds, heavy metal, Iron Maiden, Janick Gers, Metal, Nicko McBrain, NWOBHM, Parlophone, prog, progressive rock, review, Rock, Steve Harris, The Book of Souls, The Final Frontier. Bookmark the permalink.